My Dell Optiplex 9020 and the mistakenly ordered GTX 1050ti not-wimpy factor version -- Return it, find a solution, or try a magic third option? So recently I bought a refurbed Optiplex 9020 MT in a kind of emergency situation. My other machine had been stolen, I needed a computer, it was at a store, it looked nice and the nice shop guy gave me a deal. All over the internet the majority of optiplexers appear to approve of a small form factor GTX 1050ti 4gb as an ideal card upgrade, another is an MSI Pascal, which I almost went for. Here's the problem: I ordered a Gigabyte PCI-E Windforce with a 1458MHz overclock by mistake. I think I meant to get the "Gigabyte Geforce GTX 1050 Ti OC Low Profile." This was like a tired, simple, stupid mistake. So I'm doomed right? Question: Is there an adapter that can allow me to run a card that requires a PCI-E cable without me having to tear our the PSU? If I have to upgrade the power supply. I might as well just get a new computer. I'm hoping there's a component hack to this. There's also lots of support posts about how replacing the propietary power messes stuff up, I'm just not interested in messing with controlled substances.. It's so weird that Dell went this direction, I'm sort of in shock and disbelief that I can't run a PCI-E card. So, assuming there's no way to get this card to work on my machine, I have to buy the small factor tiny version it, I guess. Hopefully they'll accept my return. There's a 3rd bonus option: The day after I ordered the 1050ti, I recovered 2 barely used identical AMD Firepro 2100 2gb cards from the recycling bin at my work. Technology companies are insanely wasteful when it comes to this stuff. I tested one and it worked great. I'm thinking I could figure out a way to run a duel GPU setup with these instead? What do you think? Below is my new card. It took a little work to get it to fit in, but it's really happy now. Please tell me I can keep it? Please? RE: My Dell Optiplex 9020 and the mistakenly ordered GTX 1050ti not-wimpy factor version -- Return it, find a solution, or try a magic third option? 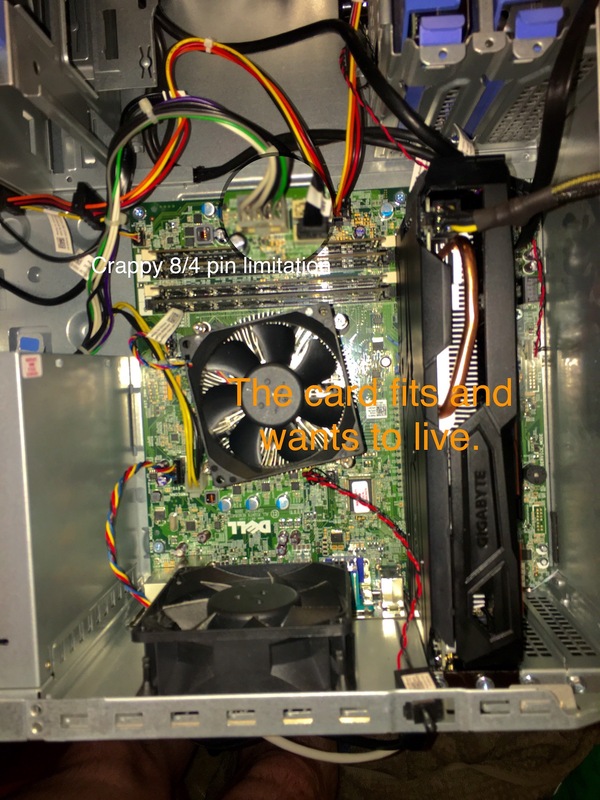 You're going to need to replace the power supply to run that card -- and a dual GPU setup is not possible on that system. You'd need a different mainboard to run a dual card setup. Thank you all for your answers, I rather thought I'd have to remove my power supply and buy the moddiy, but wanted to avoid that. My goal here was to create as little waste as possible for what I needed. I returned the Geforce, I am currently operating on the Firepro (not exactly a super gamer card, but better than the Optiplex OEM by far). I am going to try to figure out if I can hack a way to get both Firepros working in a Crossfire kind of setup in Linux. Barring this, I'll be happy with the free card for a while and I'll buy the best small form factor game card when the time comes, whether it be a 1050ti, MSI Pascal, or some other contender. I'm a big "get the most out of each component" kind of user. I appreciate you help here!